Typical street of the Albayzín. The Albaicín (Spanish pronunciation: [alβai̯ˈθin]) or Albayzín (Arabic: ٱلْبَيّازِينْ‎) as it was known under Muslim rule, is a district of Granada, in the autonomous community of Andalusia, Spain. It retains the narrow winding streets of its Medieval Moorish past dating back to the Nasrid Kingdom of Granada. It was declared a World Heritage Site in 1984, along with the Alhambra. The area that later became the Albayzín was first populated by the Iberians, the original inhabitants of the Iberian peninsula, with dispersed Roman settlements later appearing nearby. Nothing is known of its history before the arrival of the Muslim Arabs and Berbers, so it is assumed that the city was abandoned after the fall of the Roman Empire until the founding of the Zirid kingdom in 1013, when its defensive walls were built. According to some linguists it owes its present name to the inhabitants of the city of Baeza, called "Beatia" by the Romans, who were banished after the Battle of Las Navas de Tolosa and settled here outside the walls. Other linguists assert that the name derives from the Arabic al-bayyāzīn (pronounced al-bayyīzīn with the imāla vowel-shift), meaning "suburb of falconers". 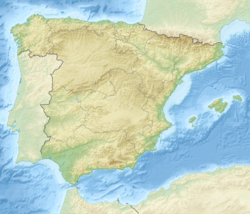 However, the fact that in Andalusia there are many other neighborhoods with that name, including those in Sanlúcar de Barrameda, Alhama de Granada, Salobreña, and Antequera, among others, casts doubt on this thesis. Iliberis (Elvira), later called "Albayzín" and "Alcazaba"
Garnata, on the hill opposite the Alcazaba, which was more a neighborhood of Iliberis. However, current archaeological research indicates the Madinat Ilbira (Medina Elvira) was located in Atarfe when that city's population was moved to the Albayzín after the fall of the Caliphate of Córdoba in the 11th century. The inhabitants of Ilbira remained clients of the Berber Sinhaya and the Zirids until the capital of the Cora of Elvira was transferred to the Albayzín hill. The neighborhood had its greatest influence at the time of the Nasrids. The Albaicín maintains the urban layout of the Moorish period, with narrow streets winding in an intricate network that extends from the top at San Nicolás and through Calle Elvira, both located in Plaza Nueva, by the course of the river Darro. The traditional type of house is the carmen, consisting of a freestanding house surrounded by a high wall that separates it from the street and including a small orchard or garden. The channeling and distribution of drinking water through pipes laid from wells was characteristic of this district; about 28 of these have been found, of which most are preserved but not in use because the pipes were broken over time. In December 1499, the Albaicín was the starting point of a rebellion throughout Granada, triggered by the forced conversion of the Muslim population to Christianity. In 1994, the Albaicín was declared a World Heritage site by UNESCO as an extension of the monuments of the Alhambra and the Generalife. Ziri wall (11th century), established along the Sacromonte and Albaicín. New door or door of Weights, the Granadian people call and know it as arc of weights. Alhacaba Towers, part of the wall. Monaita door in Lona Lane, part of the wall. Puerta de Elvira, at the beginning of Calle Elvira, part of the wall. Church of El Salvador, in the Cuesta del Chapiz. Church of San Miguel Bajo, in the small square of San Miguel Bajo, with a Mudejar armor and a cistern of the 13th century. Church of San Gregorio, at the beginning of the Cuesta de San Gregorio. St. Louis. Temple without worship and in ruins. Church of San Juan de los Reyes, in the street San Juan de los Reyes. Palace of Dar al-Horra, Aixa's residence, Muley Hacén's wife and the mother of Boabdil. House of the Masks, in the street Pagés, what remains of the house of the poet Pedro Soto de Rojas (17th century). House Yanguas (16th century), at San Buenaventura, hodgepodge of Nasrid and Renaissance architecture. Currently, a Tourist hotel. Church of Santa Ana, at the beginning of the Carrera del Darro. Saint Peter and Saint Paul, in the Carrera del Darro. Hermitage of San Miguel alto, Lane San Miguel ..
Casa de Porras, in Placeta de Porras, Moorish house of the 16th century, today the University Cultural Center of the University of Granada. Casa del Almirante (Aragon), Calle San José, 16th century. Castril House (1539) in the Carrera del Darro, Current Archaeological Museum of Granada. Lona House in Lona Lane, on the site of the former palace of the kings Ziries. Cordova Palace (16th century) in the Cuesta del Chapiz, current Municipal Archives. Casa del Chapiz, This was built on the remains of a Moorish palace of the 14th century, which preserves part of the layout of the plant and some elements that were utilized when it was rebuilt in the early 16th century by the Morisco Lorenzo el Chapiz, whose name is preserved in the set and the street where it is located. Casa de Zafra, 14th Century Spanish-Arab mansion, re-opened as Interpretative Center. Statue of the artist G.O.W. Apperley RA RI (1884-1960), unnamed square off Calle Gloria. ^ Carr, Matthew (2009). Blood and Faith: The Purging of Muslim Spain. New Press. pp. 58–59. ISBN 978-1-59558-361-1. ^ "Alhambra, Generalife and Albayzín, Granada". UNESCO Culture Sector. Retrieved 2013-02-09. ^ Granada, Ele Medios, Álvaro de Bazán 9 3º Derecha, 18010. "Puerta de las Pesas :: AGENCIA albaicín GRANADA". www.albaicin-granada.com (in Spanish). Retrieved 2018-02-22. ^ GALLEGO Y BURÍN, ANTONIO. "Guía artística e histórica de la ciudad de Granada", página, 781. Edición: Guía de Granada 1946. ^ Galán, Daniel (2015-11-04). "La casa de Zafra: 6 razones para visitar este monumento del Albaicín". EL VIAJE DEL MAPACHE. Retrieved 2016-10-22. Wikimedia Commons has media related to Albaicín. This page was last edited on 22 November 2018, at 08:47 (UTC).